You'd be good using Grunticon just exactly how it is. It just is a bit of a different approach than the one I've been talking about a lot, which uses an SVG sprite and inline <svg><use></use></svg>. If inline SVG is supported, no DOM manipulation happens at all, everything is just left alone and works. It's a bit easier to rip out the fallback one day if you decide you no longer need it. (Thanks to Scott pointing out below): Non-JS users would get SVG icons instead of fallback PNG if you chose not to Ajax for the sprite and just embed it in the document. 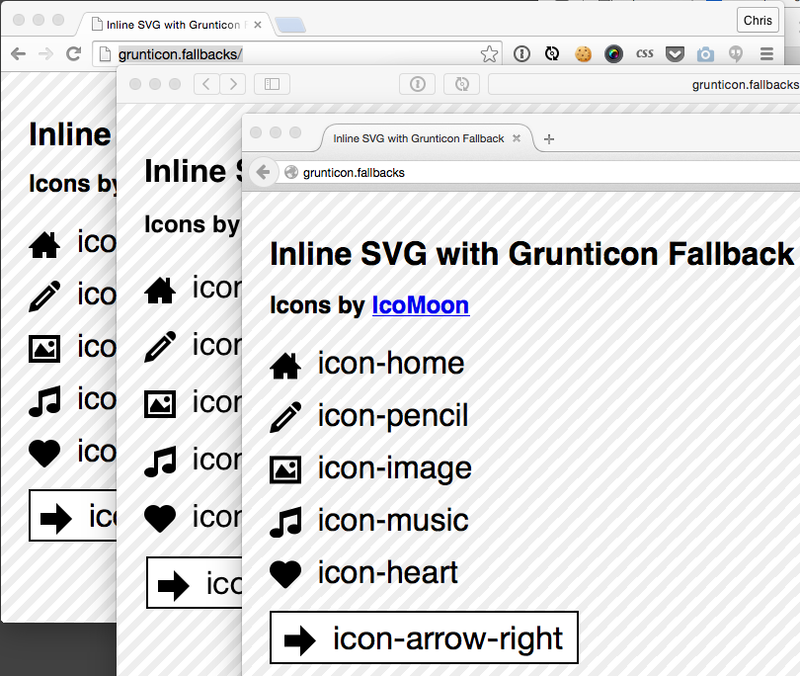 What's cool about inline-<svg>-first is that we can still use Grunticon to help us with the fallbacks! You can get them in any possible way you get get/create SVG. We'll use IcoMoon here because it's easy and awesome and gives us the SVG sprite right off the bat. If you want to make sprite creation part of your build, read up. Make sure to use the xmlns="http://www.w3.org/2000/svg" on them, which is required to give them layout in IE 8. This produces all the PNG fallback stuff for you. Modernizr has a great inline SVG test we'll hijack. This has nothing to do with fallbacks, this is just the normal process of fetching the icons in supported browsers. We do this so it works in IE 9/10/11 and we can browser-cache the sprite. It's just ever-so-slightly modified in that you delete first CSS file in the grunticon() call. That's the one where SVG is supported, and we already have that covered. Still happy in IE 9, falls back in IE 8 and Android well. As is, we're using the <svg> element itself and setting a background on it as needed for fallbacks. 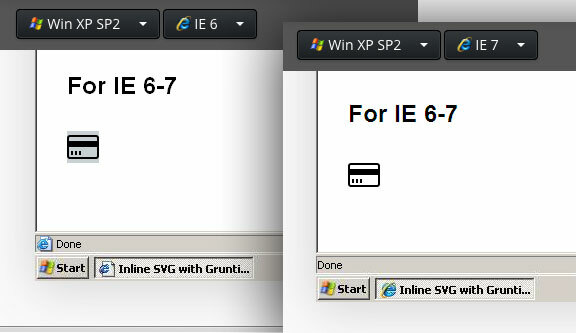 IE 8 can do that, but IE 6 and 7 can't. The SVG element will just disappear (even if you use the HTML5Shiv, weirdly enough). Another notable IE 6-7-8 issue: you don't get background-size, so, generate the PNGs in the exact size you're going to use them. I tossed the concept up in a repo in case I screwed stuff up and y'all want to fix it. Gotta love the Filament folks! I hope Filament Group shares some love with the Gulp community. Would be amazing to add this to my gulpfile. Scott, you’re the best! Picturefill and Grunticon are incredibly important for my workflow. Big props. great article and great tool ! Also, it’s a nice little bonus that a non-JS user would get SVG instead of a fallback png. In the current version1, the SVG document depends on AJAX for it to be loaded into the page. Therefore, non-JS users get no icons. To support non-JS users, I believe the SVG element would need to be served inline with the page. I have not had the glory of using SVG elements to their potential, and barely even the lower tier uses. Therefore, you should take that statement with a grain of salt. Thanks Chris, Scott and the Filament Group! Great to see something new that also covers legacy browsers well enough to use in production immediately. 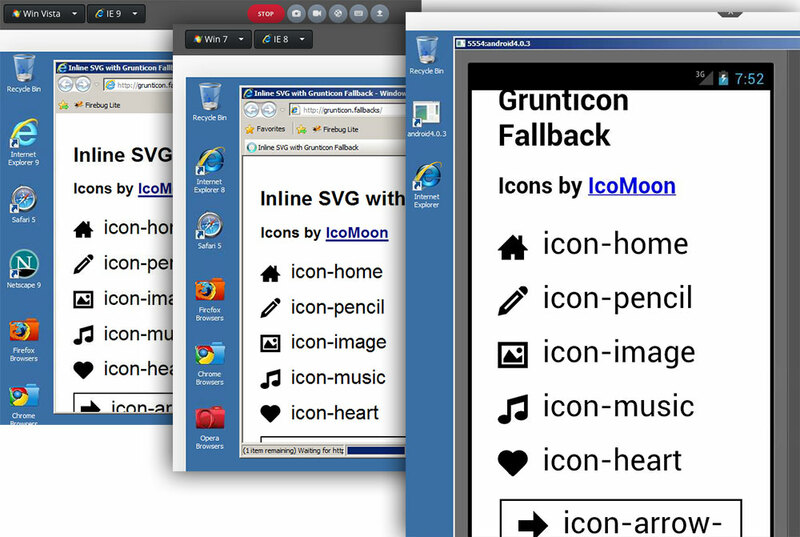 What’s the advantage of this method over say using IcoMoon for SVG sprites and PNG fallbacks, with svg4everybody for old IE/Android? Yeah the non-js doesn’t work as the the is looking for the inline svg xlink:href=”#icon-pencil”, wouldn’t it need to be something like xlink:href=”svgdefs.svg#icon-pencil”. But this would then underpin the caching effect.